We are looking for Native Speaking English (EFL) teachers for our Catholic girls' school. You must hold a passport from a country recognised by Thailand as being considered native English speaking, such as the UK, Ireland, America, Canada, South Africa, Australia or New Zealand. We need both primary and high-school teachers for the start of the new school year which commences in May, 2019. The successful candidate will be teaching up to a maximum of 22 (50 minute) periods a week in a school with friendly staff and respectful students. We will hire on attitude, more so than on experience. So, you must be enthusiastic about teaching and have a strong work ethic. You must also hold a genuine bachelor’s degree from an established university (preferably from your country of origin), a TESOL/TEFL certificate, and a clean criminal record background check. To apply please e-mail a short CV of no more than two pages with your name, picture, nationality, D.O.B, qualifications and work experience. 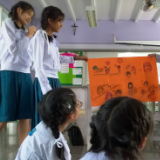 The school is a Catholic girls’ school located in Rayong, on the east coast of Thailand with a large team of teachers from around the world. We have a very well equipped school with air-con, projectors and wi-fi. Lunch is included free on work days.